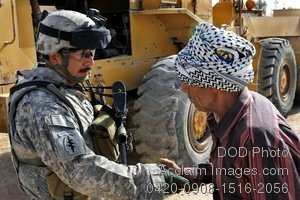 Description: Free, public domain image: Army Soldier Shaking Hands with an Iraqi Man. U.S. Army Sgt. 1st Class Edwardo Juarez, with Bravo Battery, 3rd Battalion, 7th Field Artillery Regiment, 3rd Brigade, 25th Infantry Division, greets an Iraqi citizen in Alam, Iraq, June 23, 2009. (U.S. Air Force photo by Staff Sgt. Luke P. Thelen.